Recipient of the 2016 Digital Prize from the British Society for Eighteenth-Century Studies, Circulating Enlightenment introduces users to historical sources that document literary culture in eighteenth-century Edinburgh and London, along with e-learning modules for teaching. A growing suite of otherwise unpublished primary documents, largely correspondence between authors and their London bookseller, Andrew Millar (1705-68), can be downloaded and used for teaching and research—as scans of the original manuscripts, as direct transcription, and as edited materials. These are suitable for teaching at secondary and post-secondary levels, and for scholarly research. These have been marked up using TEI, which allows users to create their own editions of these materials, which we have sourced from a growing list of repositories in the US and the UK. 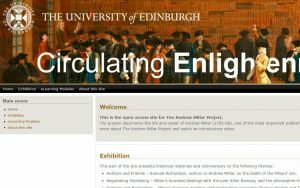 Circulating Enlightenment is an extension of an AHRC-funded research project, which collects, edits, and will publish (with Oxford University Press), the correspondence and business ledgers of Andrew Millar, one of the most important publishers of the eighteenth century. Born in Glasgow, apprenticed in Edinburgh, and in business in London between 1726 and 1768, Millar enabled the publication and circulation of major and minor works of the Enlightenment and counter-Enlightenment. His financial and legal dealings facilitated the movement of books between two great urban centres, Edinburgh and London, and his name is on the title-page of the first editions of the most influential works: from novels to poems, to plays, to theology, to philosophy, to medicine, to science. His legacy continues to shape the cultural, economic, social, and intellectual history of this period. This entry was posted in Collections, Digital Humanities and 18th-Century Studies and tagged digital humanities, Enlightenment, print, Scotland. Bookmark the permalink. Adam Budd is Lecturer in Cultural History at the University of Edinburgh, where he is director of the graduate programme in eighteenth century culture. His edition of the correspondence of Andrew Millar is under contract with Oxford University Press; its associated website, which features primary documents and e-learning modules, won the 2016 BSECS Digital Prize.